Amazon has the Learn & Climb Science Kit for Kids marked down from $24.99 to $8.99 with free shipping. That is 64% off retail! 🔬CHEMISTRY IS COOL – Girls & Boys ages 5 + will love learning while they play. 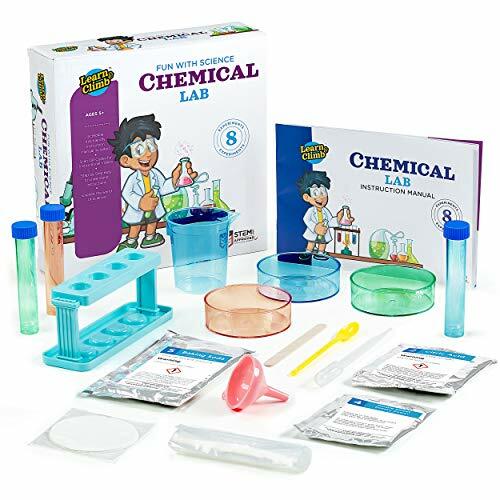 This kit teaches the difference between acids and bases in a fun and safe way as they showcase their inner scientist. 👩‍🔬A VARIETY OF EXPERIMENTS – Science kits Includes supplies: Sweet Potato Powder, Citric Acid, 1 Beaker, 1 Pipette, 1 Measuring Spoon & Funnel 3 Petri Dishes, Baking Soda, 10 Litmus Papers, 3 Test Tubes with Stand. ⚗️ INSTRUCTION MANUAL & VIDEOS – We’ve included a full color step by step instruction manual with clear pictures. to make easy to follow science experiments for kids. Plus you can scan the QR codes and watch video instructions too! 👨🏽‍🔬GREAT GIFT – Kids from ages 6-8 will love this interactive and engaging educational science kit. 8 experiments that build upon each other will lead to hours of fun and scientific entertainment. 🔎STEM CERTIFIED – Here at Learn & Climb we’ve earned the distinguished STEM Certified accreditation from the Scient, Technology, Engineering & Math professionals and educators at STEM.org.